Standing just 6'8 in shoes, P.J. Washington doesn't have particularly impressive size for a power forward, but his 7'3 wingspan and near 240-pound frame help make up for that on the floor. Washington, the 6'8 power forward out of Frisco Tex,as was another piece of the puzzle for the United States team that took home gold. Washington is somewhat undersized for the power forward position, but he uses his strong 232-pound frame and 7'2 wingspan to make up for whatever he is lacking in height. Washington is nimble and fluid for a guy his size, and while he is not the most explosive athlete he looks very comfortable finishing above the rim in space. Still just 17 years old, he has already shown glimpses of a back to the basket game, in particular a right handed hook that he can get to with ease. 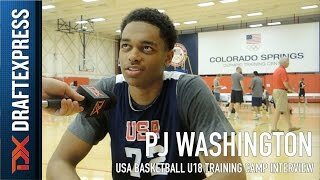 Washington has good footwork, soft hands, and nice touch around the basket, and is capable of diving to the rim or finishing on dump offs in traffic. Washington uses his length and physicality well on the glass and on the defensive end, showing the ability protect the rim while also cover ground on the perimeter. He finished with impressive per 40 averages of 4.0 steals and 2.2 blocks. Washington will have one more season under his belt at Findlay Prep before he makes his college decision, where he has all the makings of an outstanding college player with plenty of room for continued development. -Strong 232-pound frame with a 7'2.5 wingspan. -Very fluid. Can play above the rim in space. Nimble diving to the rim. -Plays mostly 15 feet and in, but has a budding skill set offensively. Soft hands. Nice touch around the rim. Can straight line drive from the perimeter. Good footwork getting to his jump hook in the post. -23 points per 40 minutes on 59.4% from two in 58 career Nike EYBL and Global Challenge games. Gets to the free throw line at a high rate  8.9 times per 40 minutes. 31.8 points and 15.1 free throw attempts per 40 minutes on 64.5% from two in 2016 Nike EYBL. -Not a shooter at the moment but his jumper has potential. Sound mechanics with good rotation and soft touch. Should be a weapon in time. -Capable passer who's fairly unselfish when surrounded by talent. -Good instincts on the glass  20.0 rebounds per 40 minutes in 2016 Nike EYBL. Soft hands, length and physicality contribute to his rebounding success. -Nice timing rotating for blocks. Can cover ground on defense quickly. Good understanding of verticality at the rim. 1.0 steals and 2.5 blocks per 40 minutes. -Short for an interior player at 6'7.5 in shoes. -More long than explosive from a standstill. -While he shows potential as a shooter, he plays mostly in the paint at this stage  8-for-34 from three and 55.1% from the free throw line. Not very polished as a ball handler. Struggles to create much offense from the perimeter. -Not all that fast-twitch on either end of the floor. A bit slow getting into his jumper and offensive moves. Has room to improve as a perimeter defender. -Lack of elite size slightly limits his upside as an interior defender. -Very productive and solid in a lot of areas, but what's his calling card? Outlook Washington, one of the most productive players on the EYBL circuit, carried his impactful play over to Colorado Springs. With a strong frame, long arms, impressive agility and a budding offensive game, there's a lot to like about Washington as a college player. He's always around the ball, can score inside the paint, find open teammates, attack the glass and make plays defensively. From an NBA perspective it will be beneficial for Washington to polish his perimeter play, extend his range and really buy into becoming a guy who can step out and defend the perimeter. It remains to be seen what Washington's most translatable NBA skills will be, but he'll most certainly be an instant impact player at the college level who's worth keeping an eye on as the rest of his game develops.